Our friends at EatWisconsinCheese.com, the consumer site of the Wisconsin Milk Marketing Board, spend their creative time developing delicious new ideas for cheese. We had a lot of fun with these picks and bites, which we served last night as an alternative to a cheese plate. Picks are finger foods served on cocktail picks or toothpicks that holds the ingredients together. Bites are self-containing and require no pick. Both are easy to create and make a big impression. Arrange a plate of contrasting colors, flavors and styles to serve with holiday cocktails. Or, serve them alongside soups or salads—for example, a shot of tomato soup with a Greek Salad Bite. 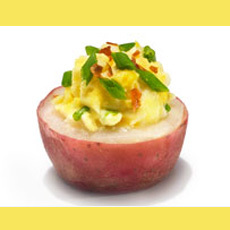 While they are delicious as is, you can enhance them with a variety of mustards and sauces. While we’ve provided a long list for your perusal, you can see them all online and download a recipe brochure. Peruse the 44 options below and pick five or so for your hors d’oeuvre plate. And check out the dessert picks for a sweet finish. 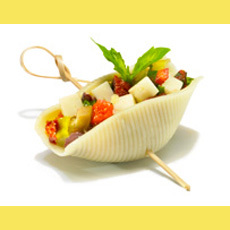 Many hors d’oeuvre can be served on a pick. Photo courtesy EatWisconsinCheese.com. An example of a bite: No toothpick required. Photo courtesy EatWisconsinCheese.com. Christmas party picks: assorted red, green and white with Christmas trees on top. Foil party picks: fun metallic fringe in blue, green, purple and silver for New Year’s Eve. Conventional frilled party picks, with cellophane frills in bright colors for Thanksgiving.